How To Make Quick and Easy Flaky Pastry. Simple to follow instructions, great for pies, strudels, turnovers and freezer friendly too! 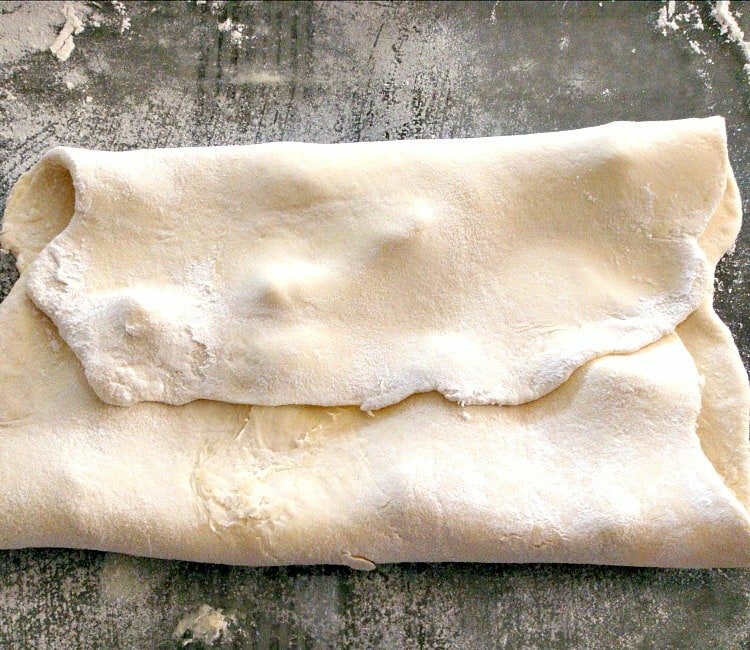 How To Make Quick and Easy Flaky Pastry. 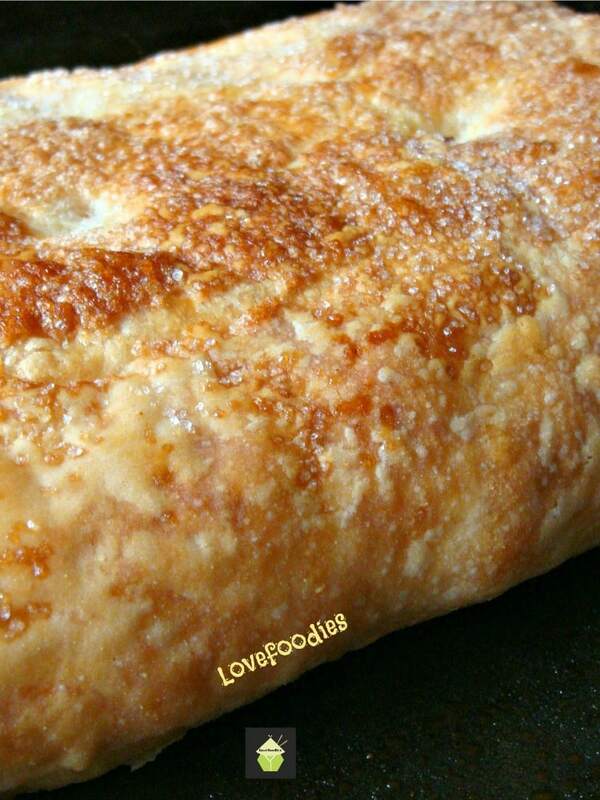 Simple to follow instructions, great for pies, strudels, turnovers, and freezer friendly too! How To Make Quick and Easy Flaky Pastry. Don’t go buying the shop stuff! Now there’s no need because here, we show you an easy step by step guide for how you can make some delicious flaky pastry which will take your breath away! It’s amazing! This is a really easy and quick recipe. Low-cost ingredients, delicious, light, crispy pastry, and a sure way to impress your family and friends! People are often frightened to make pastry, or pie dough. It can be daunting, overwhelming, tricky, and let’s face it, it can be easier to just buy ready made pastry from the supermarket, no mess, no recipe needed, just roll and use…and of course nowadays, you can get pastry that is ready rolled! So why should I bother sharing a pastry recipe with you? Well, once you’ve made your own pastry, it is very unlikely you will go back to the shop bought stuff. For one thing, it’s cheaper to make your own flaky pastry, you know exactly what ingredients you are putting into your pastry, and the flavors and textures are really like no shop pastry! trust me, you will feel a sense of achievement, satisfaction, and a mini ego boost if you make your own pastry! This recipe for flaky pastry is by far an easy one, even for a complete novice. All you need to do is follow the simple instructions, and let the ingredients do the work! 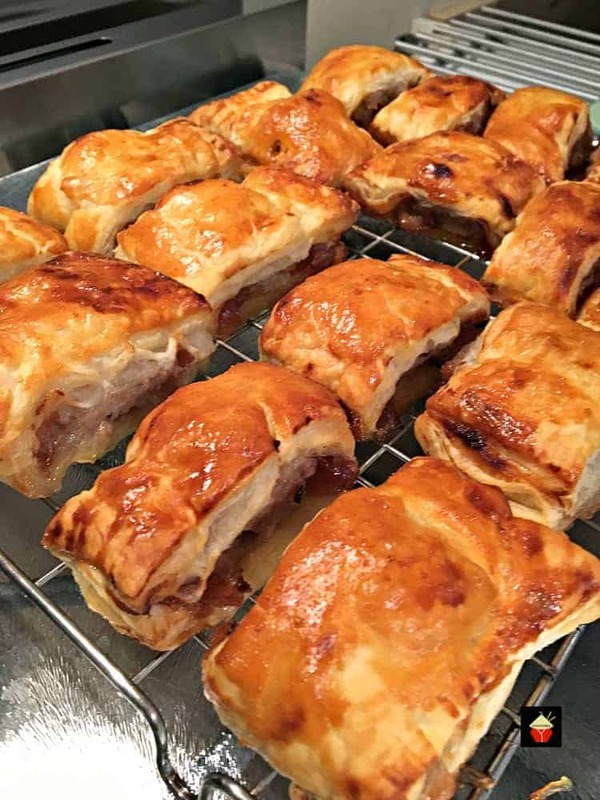 Flaky pastry has certain characteristics, similar to rough puff and puff pastry, in that you will end up with…..yep, flaky, light layers of pastry with a beautiful thin crisp crust. You have to make sure of two things when you make this pastry. 2. The oven MUST have reached the correct temperature, i.e. it must be hot when the pastry first goes in. The idea of flaky pastry is to incorporate thin layers of fat between the layers of dough, encasing as much air as possible. When the pastry is placed in the oven, this trapped air expands and lifts each thin layer of pastry separately. You get the idea…? So…are you ready? It’s easy, just follow the steps and hey presto! you will have learned how to make your very own quick and easy flaky pastry! 2 tablespoons sugar if making a sweet dish. 2. Weigh out the butter and divide into 4 amounts. 3. Add one portion of the butter to the flour and using a round-bladed knife, incorporate the butter and flour, whilst slowly adding enough cold water until the mixture comes together to form an elastic dough. 4. Dust the rolling surface with flour, and turn the dough out. Roll out the dough into a rectangle shape (see photo) and keep rolling, adding more flour if necessary to stop from sticking, until the dough is about 4 mm thickness. 5. Rub any excess flour from the surface and using the next portion of butter, dot the butter (about 1 cm dots) on two-thirds of the rolled out pastry evenly. (see photo). 7. Press together pastry edges with your fingers, give the pastry half a turn and roll out lightly again until the pastry is 4 mm thick (same size before you dotted with butter). 8. Repeat steps 5 – 7 twice more, then fold into three, cover with plastic wrap and chill in the fridge for 30 minutes. Whilst the pastry is resting in the fridge, set your oven temperature to 200C, 400F, gas mark 6 if using pastry as a pie with filling. Cooking time about 20 – 35 minutes. Then sprinkle some sugar, spices such as cinnamon, if a sweet dish, or savory spices, like jerk seasoning, cajun spices, actually, anything that takes your fancy! Cooking times will vary depending on what you are using the pastry for. As a rough guide, 8-10 minutes for something small, 20-35 minutes for larger pies, or until the pastry takes on a nice golden brown color. 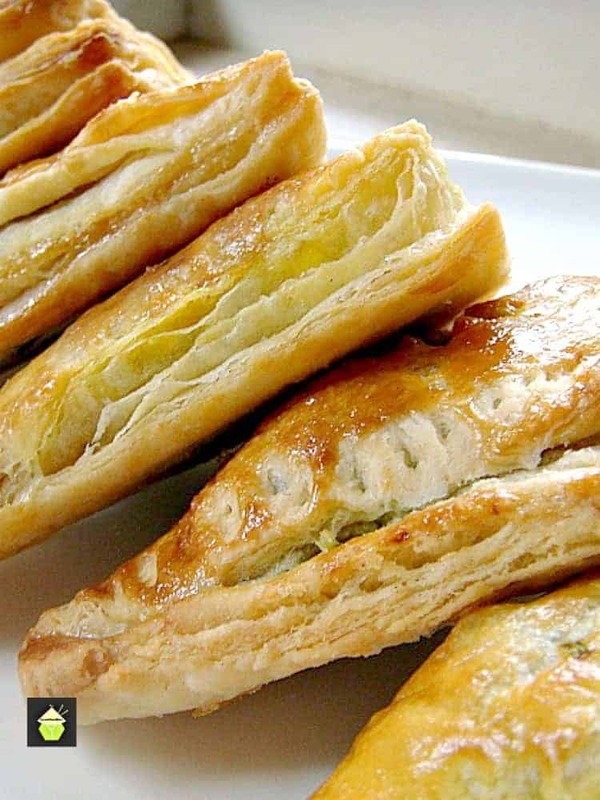 We’d love to hear from you and what you thought of our quick and easy flaky pastry recipe. Did you make any changes or add some other goodies? Let us know in the comments below. Thanks for reading and happy cooking! 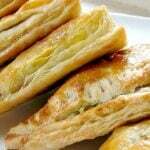 Here are a few more recipes where we’ve used flaky pastry. So delicious! Add one portion of the butter to the flour and using a round bladed knife, incorporate the butter and flour, whilst slowly adding enough cold water until the mixture comes together to form an elastic dough. Dust the rolling surface with flour, and turn the dough out. Roll out the dough into a rectangle shape (see photo) and keep rolling, adding more flour if necessary to stop from sticking, until the dough is about 4 mm thickness. 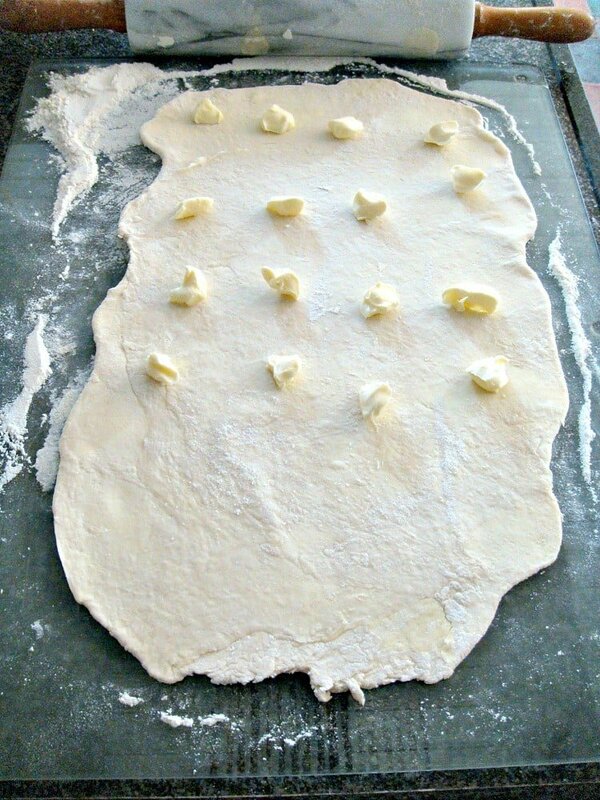 Rub any excess flour from the surface and using the next portion of butter, dot the butter (about 1 cm dots) on two thirds of the rolled out pastry evenly. (see photo). Press together pastry edges with your fingers, give the pastry half a turn and roll out lightly again until the pastry is 4 mm thick (same size before you dotted with butter). Repeat steps 5 - 7 twice more, then fold into three, cover with plastic wrap and chill in the fridge for 30 minutes. Can I use a butter substitute? Or Cream Cheese? It is currently cooling, but I’m nervous. The butter kept leaking but I hope it turns out okay. Anything I do wrong? Hi Amanda, so long as the butter was chilled when you were rolling out the pastry it should be ok. You can expect the bitter to squish out a bit when you’re folding the layers and rolling, so don’t worry! Lived up to its name–flaky, buttery and yum. I usually make shortcrust pastry and was wary of anything more complicated, but this was easy. Thank you. As someone who has NEVER made my own dough/crust, never even used a rolling pin successfully, but is a decent cook; I would love a quick video! May I know if they are baked at 200 degrees fan? Hi, yes, it’s 200C or 400F. Just made this for turkey pot pie and I’m so thrilled with how amazing this turned out! So flakey, so tasty and so easy! The layers are not rising of my puff pastry.please tell me the reason. Made sausage rolls and the pie crust was easy to make and flakier and delicious than the store bought kind. Thank you for the best and eqsy recipe. I’m going to make this again but add salt to the dough. I put a pinch of salt in twice and it was still very bland. Are you using salted butter ? Otherwise I did end up with flaky layers. Thanks so much! I was skeptical at first but it really did only take 15 minutes to prepare. I just applied this recipe, cut the dough into rectangles, sprinkled some cinnamon and sugar on top, added some hashes with a knife for design, and it’s in the oven right now! Smells great. Can a food processor be used for the first 3 steps of this recipe? Hi there, yes, you can start off with the food processor. Just be sure you don’t over mix! 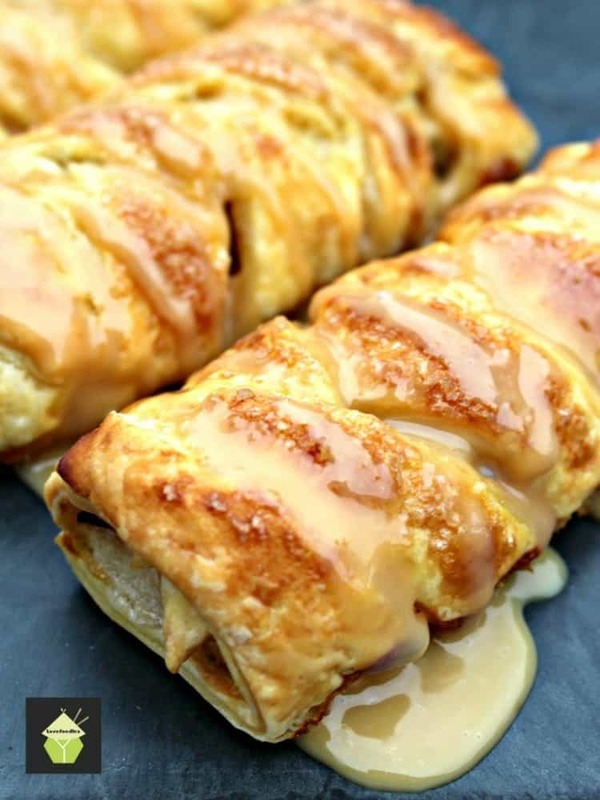 I want to use this recipe to make turnovers for breakfast in a couple of days. But the kids wake up pretty early. So I was hoping to make the pastry dough the night before. I know it says to chill it for 30 minutes, but will it mess it up if I leave on the fridge overnight? Hi Blythe, yes, there’s no problem to chill overnight. You can even make it and freeze. If frozen, simply defrost in the fridge or at room temperature before you roll it out for baking. Great! Thanks for letting me know! Very excited to try out the recipe! When u take it out of the fridge should unfold it, should I roll some more ,how much filling should I put in the raspberry filling ,it’s canned. Whayt about the remaining butter??? I think the extra butter you use when you do the other 2 folds. She says repeat steps and that step is dot with butter. I thought all dough requires some yeast in oder to rise. No mention in this recipe of any. This seems to be like a cross between a pie crust dough and viennois, mixing the techniques. Folding butter in like viennois but no yeast like a pie crust. Should theoretically result in a richer more layered pie crust-like result, which doesn’t sound bad as an alternative. After the 30 minutes then I roll again, can I freeze it for later use? 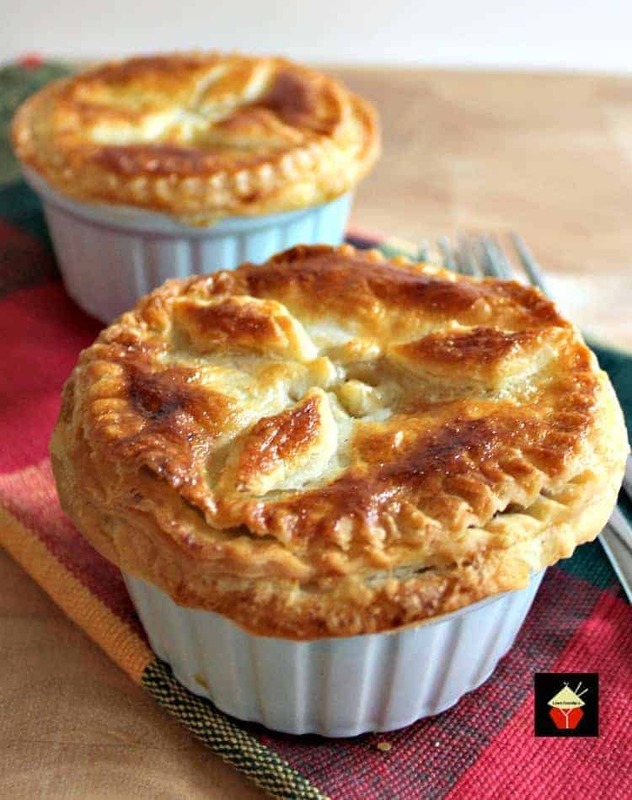 Are there any suggestions for using this recipe for a Two-Crust pot pie??? What happens after it comes out of the fridge? Do I roll it out thin again? Hi Sandy, yes you’ll need to roll it when it comes out Of the fridge (let it come down a little to room temperature for about 20 minutes before rolling as it will be a bit stiff from being cold). You need to roll so it is about 1 cm thick, and all an even thickness. I’m not sure what you’re making, if it is like a strudel with the filling, I would suggest making a rectangular shape pastry and then using about 1 1/2 cups of pie filling all along the middle, fold over and brush with some milk, sprinkle a bit of sugar on the top and bake. Make sure all the edges are sealed down (I just use the back of a fork and push down all along the edges so. I filling leaks out. If you’re making a pie, then you’ll need to fill the pie dish about 2/3 full and pop on a baking tray incase of any over spill whilst baking. Is this the correct pastry for vanilla slices ? Mmmmm….now I have malicious plans for those hand picked frozen blueberries in my freezer! Muah ha ha! ooooh yes! Blueberry turnovers would be super yummy! A tip for you, if using frozen fruits, don’t defrost them first as they will make the pastry go soggy! Use them straight from frozen! Happy blueberry baking! I’m so jealous you have home grown ones! I think I will be trying this sometime next week. That’s great to hear! Please enjoy! What a great tutorial. You were so specific I bet even I could do this. I’m certainly going to give it a try! why thank you! You should try it for sure, it’s easy, freezable and cheap to make! !